Simi MatchiX is a software for markerless and automatic tracking. The pattern matching algorithm, i.e. the acquisition of motion data, is performed on the basis of video or bitmap sequences in which objects are automatically tracked by Simi MatchiX. In this way all rotational, path and time data are provided by the software. The integrated calibration system allows movements to be measured in different planes and scaled to real-life coordinates. Since the acquisition of motion data is based entirely on visual methods, performance of the movement is not impaired or hindered in any way. 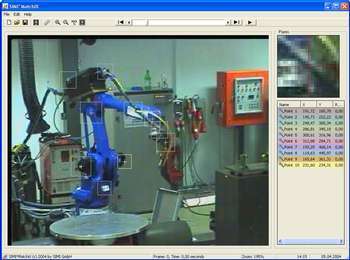 Depending on the type of movement to be analyzed, objects can also be tracked without using markers. The simple user-friendly software enables fast and accurate analyses. All captured data can be exported as text or Excel files to other programs such as Simi Motion, MattLab and SPSS. Simi VidBack supports and helps you in learning and teaching movements and techniques in physical education lessons or training sessions. To use Simi VidBack all you need is a standard DV camera and a notebook with a FireWire interface. The software delays the playback of a recorded performance by the amount of time required by an athlete to get to the computer screen. The athlete can then watch the technique he has just practised on the screen and receives scientifically proven, efficient feedback about his performance of the movement. While one athlete is watching his own performance, the next person can be performing the test. In addition to this playback function, the software also allows you to save video sequences � even after the performance has already taken place. The trainer or athlete can decide if a video clip should be saved.